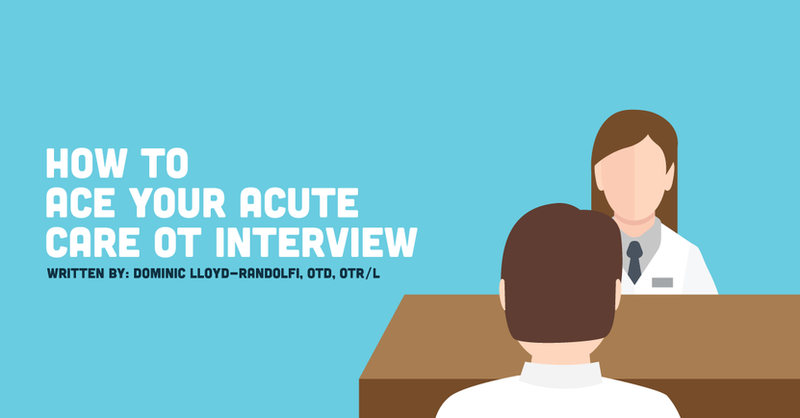 Without further ado, here's how to ace your acute care OT interview! Why do you like to hire new grad OTs? New grads bring fresh perspective and knowledge that can be really energizing for existing teams. They have often been in a variety of settings and bring knowledge about different practice areas, as well as best practice as they’ve experienced it elsewhere. New OT graduates whom I have brought on have been closer to the new assessment tools and evidence, which can propel more seasoned therapists toward adopting more evidence-based practice. My hesitation in hiring new grads is twofold: lack of experience and (sometimes) lack of understanding regarding hospital systems. Unfortunately, as a manager, I also have to consider efficiency as budgets are often tight. It is always helpful if Fieldwork sites have prepared students to be efficient, as well as productive. It also helps if new grads know what their previous productivity was when they were students. This is sometimes unfortunate, but necessary, as businesses need to make budgets to retain and hire more staff and be able to manage other budgetary needs, such as new equipment. What sticks out on a resume that compels you to bring an OT in for an interview? I like to see concise, yet descriptive, information about where a prospective candidate has spent time in Fieldwork, as well as any volunteer hours the applicant has accrued and any and outside clubs and organizations to which the applicant belongs. Perhaps more importantly, I like to see how applicants made an impact in those settings (implementing changes, etc), as well as skills they obtained. I have met many OT graduates who decide that they want to work in an acute care settingfor their first job, in order to gather a broad base of experience before moving into a more specialized area. Many of these grads have not had a Fieldwork experience in the area in which they are applying. I also like to see some outside experience, either volunteer or work experience, clubs or organizations that have a service component so I know that they’ve worked extensively with people in a position of being of service. Also, previous leadership experience, whether someone was an officer in a club or started something new, shows me the type of initiative they will likely have in the workplace. I like to hire new OTs who are hungry for mentorship, as well as leadership. This tells me we can inspire them, as well as learn from them. If a resume is well-written and speaks to what the individual has done, as well as skills they possess, I don’t find that cover letters are necessary. In fact, they can be redundant. Unless there is a special story that a prospective candidate wants to share with me that can’t be communicated in a resume, I don’t think that they bring much more to the picture. For example, there was an applicant who had a child at our hospital and had such a great experience with the nursing and hospital staff that she wanted to be a part of our organization once she became an OT. In her case, I thought that the personalized story was a nice touch and additional evidence that we had a special way of taking care of patients that she was moved to be a part of. Do you prefer applicants with relevant Fieldworks? Absolutely! If you have an idea of an area in which you want to start your practice, do what you can to get relevant experience in your Fieldwork. If you’re in a larger system that will allow you to spend some time in acute care, for example, even if you can’t be mentored there, the initiative is important to demonstrate. Often, because our market is fairly saturated with graduating OTs, graduates with recent relevant experience in the area of practice will get preference for interview call-backs over those who don't have the experience or background. When should an OT ask about benefits, pay, etc? The salary is often something that our HR will discuss with a candidate in a screening interview that they facilitate. This may be unique to my particular facility, but in our case, HR provides a salary range based on experience early in the interview process. The candidate can have the opportunity to explain how he or she stands out, based on exceptional work experiences, past leadership roles, etc. For difficult-to-fill positions, there may be more wiggle room on salary negotiations and sign-on type bonuses, but new graduates shouldn’t be surprised if there isn’t much wiggle room on salary in a saturated market or in larger hospital systems. Know what to expect in terms of pay and benefits based on region and type of setting by doing some research on websites like Glassdoor. Does the OT school an applicant attended affect your decision? I’m not as concerned about where a candidate went to OT school as I am about what they did when they were there. I like to hear about their experience in extracurricular activities, OT and non-OT related, from their time in graduate school. Do you ask new grad clinical simulation questions in interviews, such as precautions, critical lab values, or ethical situations? One thing I'll commonly ask in an interview is the following: Describe a patient who wasn’t motivated to work with you in therapy and how you encouraged their participation. The answer to this question tells me a lot, first of all, how they use themselves therapeutically in practice is important. I like to hear about something that they found out about a patient to get them motivated, such as a relevant goal, occupation, or family member who got involved. It also tells me what tools the applicant has for assisting with participation and motivation, as these can be challenges in an acute care setting when patients are not feeling well and can be prone to refuse therapy. This tells me about how they operate in terms of teamwork, conflict resolution, expressing their needs and other important workplace behaviors. What sort of questions should a new grad ask YOU during an acute care OT interview? DO come prepared with questions; it shows that you are invested, have done some research, and are interviewing your employer as much as they’re interviewing you. Candidates who ask thoughtful questions, even if they think they know the answers, really set themselves apart in the interviewing process. Also, if you’ve put in an application, in my experience, it doesn’t hurt to call the hiring manager if you haven’t heard anything in a few weeks after applying. By reaching out, it shows that you are interested and motivated. Plus, being proactive may afford you the opportunity to bend the ear of the manager to ask a few key questions which might prompt them to bring you in for an interview.